Right now, I have three paintings that are in progress. You saw the last one, my large overly ambitious succulent garden painting. I am a little stuck with that one right now and had to put it down. I started a smaller succulent painting that is much less daunting. I’ll give you an update on that one soon. And, as if that wasn’t enough on my plate, I am working on a Lady Slipper Orchid painting for my mom! I’m super excited about this painting for my mom though. 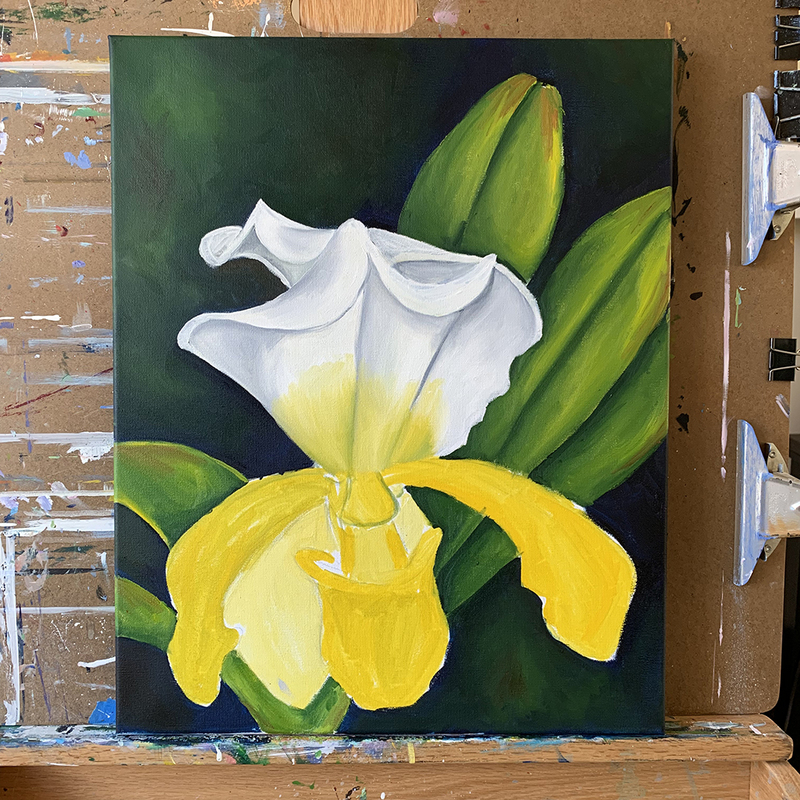 I took her to the Chicago Botanic Garden 2019 Orchid show a few weeks ago and was totally inspired to paint this particular orchid for her because these are her most favorite orchids. I don’t know, there’s something about these that she loves so much. I decided to try and paint it in similar colors to the Yellow Rose painting I made for her last year. I imagine she’d have these hanging side by side. Lady Slipper Orchid- almost finished! Day 1: I drew the flower and just filled in the canvas with paint. I’m not worried about the color or the shape of the orchid yet. I’ll fix it as I go along. Day 2: I darkened the background color and painted the leaves. I like where this is going so far! Day 3: Totally changed my mind about the background color (it was a dark dark blue) and I decided to make it a dark green to coordinate with the Yellow Rose painting I did for my mom last year. I added highlights to my leaves and I started painting in the white petals on the orchid. Day 4: I tackled the yellow petals and the “slipper” portion of the orchid. It’s looking good! Now all I need to do is refine the petals, and add the finishing details. Stay turned! Hey there! Long time no see! After the #the100dayproject concluded, I took a small break from painting and focused on creating 2019 calendar templates and 2019 photo calendars for my shops. I wanted to make sure I finished those by end of September. I have good news- I finished and they turned out really great. And do you know what that means? I’m painting again! WOOOO! After painting 100 tiny 3”x3” canvas, I decided it was time to go big. 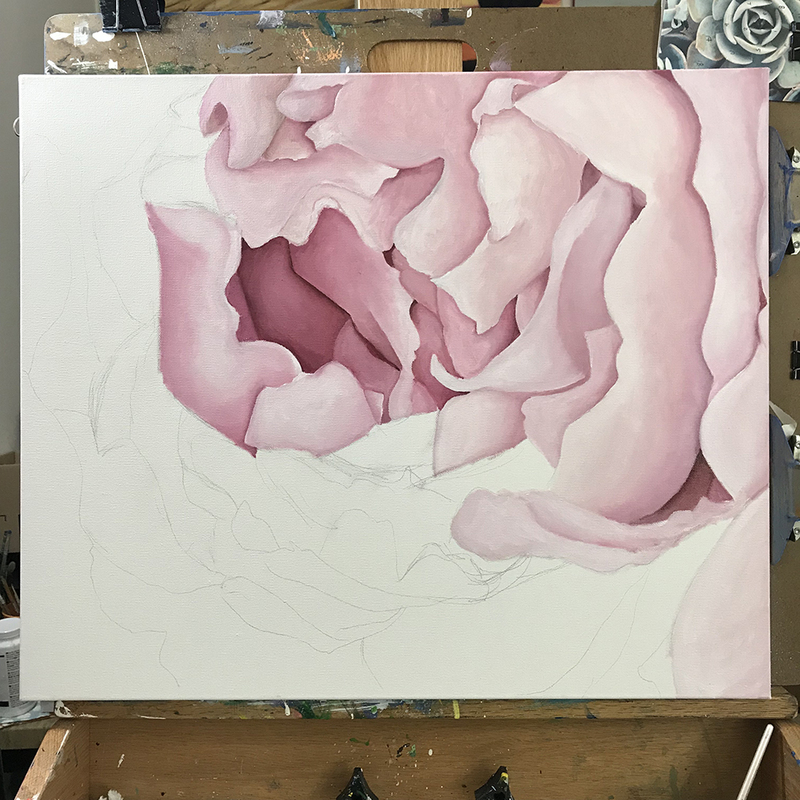 I picked up a sweet 20”x20”x2” canvas and began my peony painting by lightly sketching out the shape. I’ve wanted to paint this peony for so long! The layers and shape of the petals are so luscious and drew me in. I can’t wait to show you the finished painting! Here it is! My last little painting for #the100dayproject! 100/100. Saguaro. 3"x3" acrylic on canvas. I love how this turned out! I'm a big fan of using the finger painting technique I used during last years 100 Day Project. I think it makes the backgrounds look so interesting and gives it a depth that I struggle to recreate with a brush. This years 100 Day Project was great. There was far less blood, sweat, and tears this time around. I cared about the outcome (of course) but I learned that not every piece has to be a rock star. I feel like I experimented a lot more this year and I found a few things that set my soul on fire that I cannot wait to try on a larger canvas! It's a little impressive to see all 100 tiny paintings all in one place! If you're in a funk with your art, be it painting, photography, baking, etc., I wholly recommend participating in some sort of challenge like this. Creating 100 pieces of anything will help spark new creative ideas! Have you finished your challenge yet? How did it go? What are some of your thoughts/feelings about how it went? Let me know in the comments section below! Let's compare notes! I'm so close! I feel like I have to make my last painting something spectacular and amazing. I mean, no pressure or anything, right? In the meantime, here are the final few before the big 1-0-0. 96/100. Agave. 3"x3" acrylic on canvas. 99/100. Current Mood. 3"x3" acrylic on canvas.